We’re committed to your continuing diver education! 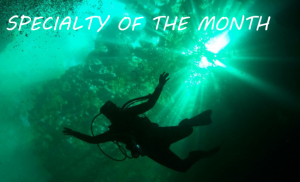 Participate in our Specialty of the Month and receive 15% off the course! Take 5 specialties, get Master Scuba Diver! See our EVENTS PAGE for already-scheduled events. Don’t see one scheduled? Contact us! We work around your schedule. Diving Specialties are a great way to improve your skills and experience new things underwater.